Creativity is always a leap of faith. Writers sit down in front of empty pages. Painters stare before blank easels. Thespians rehearse looking toward empty stages. Metal artist Bill Ryder’s leap of faith is experimental by nature. He explores his creativity with Smith Corona plug-in typewriters, antique Dromann seam machines, silvery cable chains discovered at garage sales, sheet metal from Pacific Steel, and the curved internal organs of 8 mm projectors purchased from thrift shops. His leap of faith is as much self-exploration as it is the celebration of the torch flickers and vintage portions all part of the process. 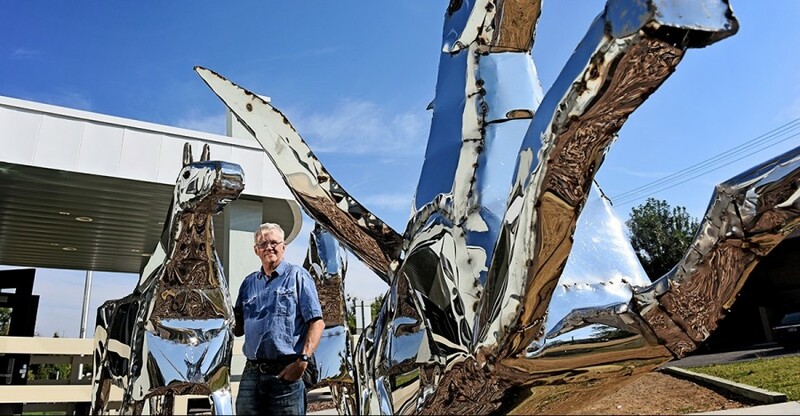 “You just need to get a whole bunch of stuff together, start making it, be brave, and whack it up,” said Bill Ryder, noted primarily for this metal horse sculptures. In the yard of his Helena home, there are plenty of unique materials waiting to be repurposed into welded metal art: small packages of fixtures picked up at the estate sale of a former plumber; tire chains to eventually be re-used as part of a horse mane; heavy steel bicycle parts, pawn shop rescued tools; Domestic Rotary antique sewing machines. Bill’s welded metal artistry is a family affair, for he is joined by his wife, Julie, on projects. The pair often place driftwood in the scaffold of his larger horses. Bill collects the driftwood and Julie positions it. Some of their horses are embedded with more reflective items, such as a deceased lineman’s belt buckle or military insignias or mementoes. All Ryder horses begin with steel telegraph wire, copper coated welding rod, or electric fence wire. After the heat of the torch attaches the frame, it can be filled in with various kinds of rusty, vintage ingredients. Sometimes Bill will wrap brass or ceramic around the steel framework of the horse and weld them. No matter what is applied inside or to the exterior, the finished product is handsome, strong, and immortal. Perhaps the immortality of the work stems from the fact that the Ryders do not believe in the idea of a useless mechanism. In their estimate, there is nothing obsolete about a broken contraption. If a machine no longer clicks or whirs, it is still a beautiful piece of equipment chock-full of complex mechanics. Indeed, old devices provide simple artistic solutions, both the questions and answers. During outings to antique stores, junk shops and garage sales, the Ryders discover items that they perceive as all part of a continuum; the artistic force in question is perpetuity, the eternal mode of expression, the deliberation of past, present and future. Typewriter parts receive special consideration. Bill said that most of the pieces he cannibalizes for parts hold more of an intrinsic value than a financial one. But even if that were the other way around, he said he would still dissect them. The son of a mechanic, Bill Ryder’s passion took on a decidedly repurposed quality years ago when a momentary respite from the daily grind allowed him to better focus on the medium of sculpture. Torch in hand, auto-darkening helmet clamped around chin, he began creating unique “assemblages” and horses made of inexpensive vintage finds and old unwanted objects. He packed his frames – mostly ones resembling horses, ranging from miniatures to ten feet tall – tight with mechanical density. He raised enough interest to warrant teaching welding and art classes. Bill chuckled as he recalled a recent welding class he instructed in Lewiston; the class focused on the construction of small-form horses. Originality is the essence of Ryder’s veritable scholarship. Creativity is his soul. His degree is in the resurrection of memories and the belief in nostalgia; some of the best things in life are those forgotten trinkets you have to go digging around for in a closet corner or on a sandy shelf in the attic.